In today’s society, living beyond your means is considered normal. When you see something you want (but can’t necessarily afford), you have immediate and easy access to money by simply swiping a credit card. On top of that, you are tempted with eye-catching advertisements for products that look life changing! It is very easy to become accustom to a lifestyle that you can’t even afford. 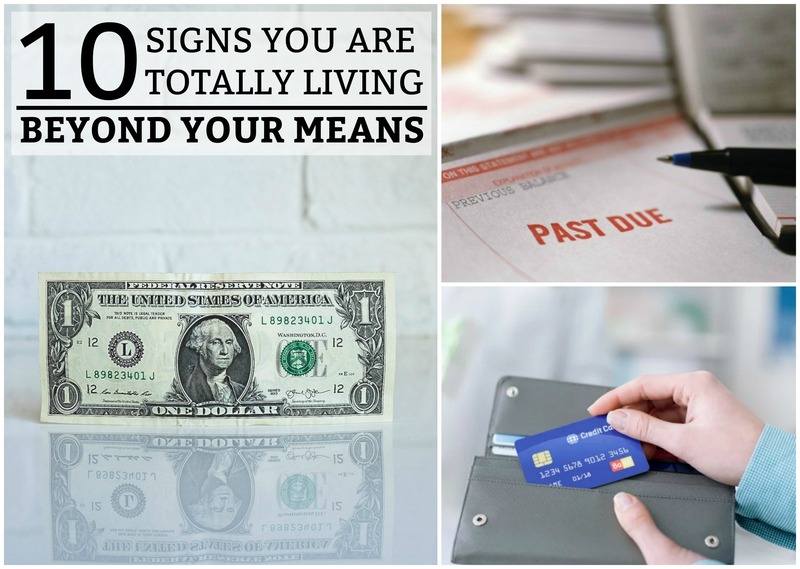 Below are 10 warning signs that you may be living beyond your means (and some important advice to help you get your finances back on track). An emergency fund is something you should start as soon as you receive your first paycheck! Unexpected expenses, unemployment, and sickness are very normal parts of life. Ideally, an emergency fund should be enough to pay 3-6 months’ worth of expenses. Try to save at least 10% of each paycheck until you reach your goal. Occasionally, add extra to your emergency fund to accelerate the process. Put your tax return into the fund and cut back on monthly expenses. If you find yourself in unfortunate circumstances, you can either fall back on your emergency fund or get into credit card debt. According to this CareerBuilder survey, 78% of U.S. workers live paycheck to paycheck to make ends meet. Unfortunately, this statistic is steadily rising due to the severe lack of financial knowledge most people have. Most people believe that their salary is not high enough to sufficiently support themselves. However, there is always a way to cut back on expenses! Take some time to create a simple budget for yourself and take the first step towards financial security. According to a 2017 Forbes survey, the average American spends 10% of his annual income on vacations. On top of that 55% of Americans don’t even make their vacation a part of their budget plan! You absolutely must have the available finances to take a vacation because a vacation isn’t a life need – it is just a want. For several years, I haven’t had to pay for my vacations because I learned these hacks to make and save vacation money. Unless you can easily afford it, buying a new vehicle is always a bad idea! A new car is NOT an investment! A vehicle is a depreciating asset – meaning as it ages, it rapidly loses its value. When you drive a brand new vehicle off the lot, it has already decreased in value. Stop viewing your vehicle as a social status symbol! If you are living paycheck to paycheck, you cannot afford it. A second-hand vehicle will still be “new” to you and it will also not leave a painfully large dent in your monthly budget. Although there are several factors that go into your credit score, the two biggest contributors are your payment history and the amounts you owe. If you are living beyond your means, chances are that you are more likely to rack up credit card debt and find yourself unable to pay all your bills. If you are consistently only paying the minimum payment on your credit card(s), you need to make some major financial changes. Paying off your credit cards should be one of your top priorities because the average percentage rate is 15% – 23%. Also, making your payments in a timely manner is one of the most important steps in building good credit. Although you may not feel this way now, retirement will come much quicker than you think! If you start saving for retirement early on in your career, you will have a significantly larger amount of money. You should be setting money aside in a 401(k) and a Roth IRA. Do you know how quickly money can compound over time, given it is in an average fund earning 8% – 10% each year? It is a HUGE amount of money saved if you start as soon as possible. Do you have to do the “walk of shame” and ask for money from those who are closest to you? This should only be done during emergencies! If you have to borrow from family or friends, always pay them back. Money is the #1 cause of resentment in all relationships. Although your mortgage or rent is the largest monthly expense, it should never go beyond 30% of your monthly take-home pay. This 30% includes your mortgage payment, property taxes, homeowners’ insurance, etc. If you are paying more than this, your home is too expensive for your current earnings. This is typically the #1 problem of people who live beyond their means. They are not aware of the exact amount of money that comes in and goes out. Creating a budget is simple, but has the power to completely change your financial life. All you need to know is the amount of money you earn and the amount of money you spend each month. Read this article to help you set up a great budget! Living beyond your means will set you up for a life of financial stress. To avoid this problem, you must set reasonable expectations for your lifestyle. Only then can you avoid overspending and create a life of financial freedom.